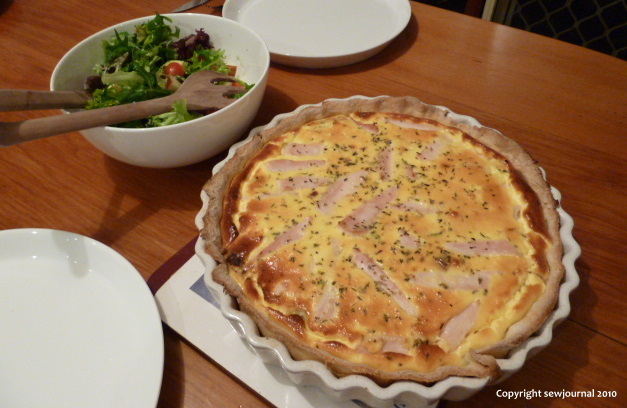 Last night we had smoked chicken and leek quiche and I thought you might like the recipe so you can try it for yourself. It really was tasty. Mix the flours, salt and herbs in a bowl. Cut the butter into the flour and then rub in until the mixture looks like coarse bread crumbs. Add the water and mix in with a round-bladed knife. Knead the pastry gently until it forms a ball and leaves the sides of the bowl clear. The less kneading the better as the more you work the dough, the more you will develop the gluten and the pastry will become tough. Turn it out onto a lightly floured board and roll out to fit your quiche dish. Grease the dish lightly and line with the pastry. Don’t cut to size until the filling is ready. Set aside and leave it to rest while you make the filling. Turn your oven on to preheat it to 200C. Cut the dark green tops and the roots off the leeks, remove the outer layer and then split lengthwise. Wash under running water to remove any grit that is between the leaves. Slice the leeks and sauté in the olive oil until the leeks are slightly caramellised then remove from the heat. Remove the skin and any fat from the smoked chicken breast and slice. Crack the eggs into a bowl and whisk lightly then pour in the sour cream and whisk gently until homogenous. Don’t be too vigorous here you just want the sour cream mixed in thoroughly. Place the leeks in the bottom of the pastry case and then trim the pastry. Layer the smoked chicken on top of the leeks. You need enough chicken to cover the leeks. Pour the sour cream/ egg mix over the chicken. Sprinkle either a little paprika or a little oregano on the top. Place the quiche in the middle of the oven for around 40 minutes or until golden brown on top. Serve with fresh salad. Note about seasoning: I don’t add salt to this recipe because the smoked chicken is fairly salty and I think if people want it saltier then they can add it themselves. It looks delicious, I love leeks and I love smoked chicken so it’s got to be a winner. Thanks for posting it.